At its regular business meeting last week, the Oneonta City school board named former interim Oneonta City Schools Superintendent Tim Nabors middle school principal in the interim pending a permanent replacement for former middle school principal Brad Newton, who resigned to take another job. The board also heard a report from academic accountability coordinator Lauren Wilson on the school system’s results on the Alabama State Department of Education (A-F) Report Card. Wilson reported improved results this year over last year in major scoring categories including academic achievement, academic growth, graduation rate, and college and career readiness, among other measures. • continued enrollment of one elementary school non-resident student for the 2018-2019 school year. • enrollment of four middle school non-resident students for the 2018-2019 school year. • dismissal of one elementary school non-resident student and placement of eight elementary school students on probation for the second semester of the 2018-2019 school year. • placement of one high school non-resident student on probation for the second semester of the 2018-2019 school year. 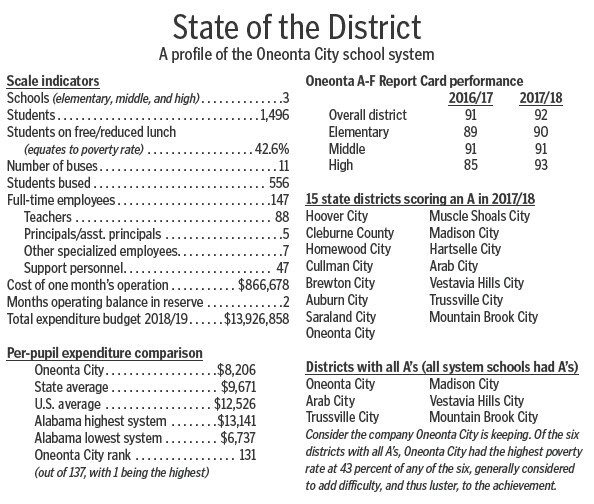 • the resignation of Brad Newton as principal of Oneonta Middle School, effective Jan. 25. • Tim Nabors as interim principal at Oneonta Middle School, effective Jan. 25. • the resignation of Tawanna Clark as high school varsity cheerleading sponsor, effective Feb. 1. • Kateland Sibert as high school varsity cheerleading sponsor, effective Feb. 1. • the resignation of Vicky Smith, child nutrition program worker, effective Jan. 21. • the employment of Mindy Egan as child nutrition program worker for the 2018-2019 school year. • Modern Heating and Cooling of Gadsden for the project of coil replacement on the auditorium heating/air conditioning system for $32,000. • accepting the heating/air conditioning system base bid of $499,861 from Williford Orman Construction LLC of Pelham for the competition and auxiliary gyms and new weight room – for installation this summer. • budget amendment #1 for fiscal year 2019.